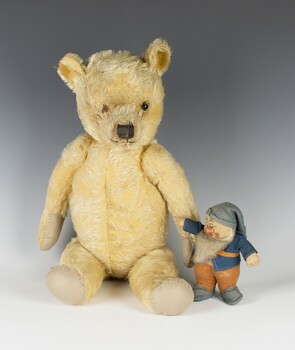 A Merrythought Cheeky child's hand muff with a bell in each ear, amber and black eyes and stitched snout, height 35cm. 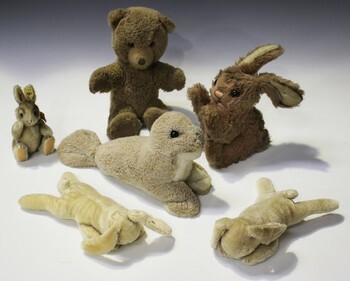 A mid/late 20th century Steiff teddy bear with brown and black eyes and stitched nose, the body with fabric pads, height 25cm, together with four Steiff soft toy rabbits and a soft toy seal. 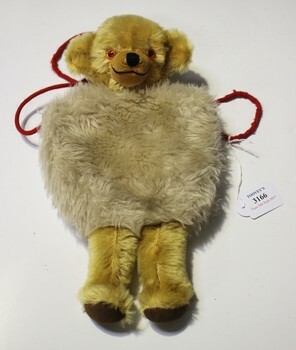 An early/mid-20th century mohair hump back teddy with amber and black eyes and stitched snout and claws, the jointed body with felt pads, height 65cm (some bald patches and repair to left side of body). 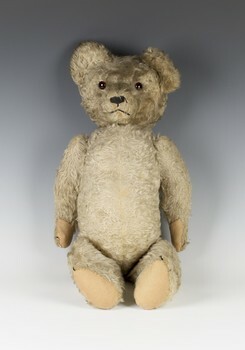 An early/mid-20th century mohair teddy bear with black and white eyes and stitched snout and claws, the jointed body with felt pads, height 61cm (some bald patches, one eye missing, pads replaced), together with a black and white photograph and a Chad Valley soft toy figure 'Sneazy' (playwear). 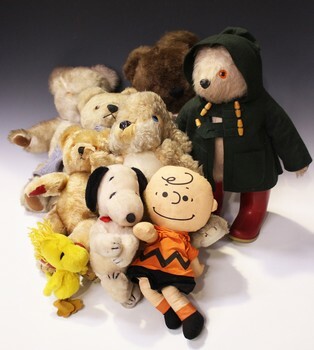 A Farnell Alpha mohair teddy bear with amber and black eyes and stitched snout, the jointed body with red pads, height 34cm, together with a Paddington bear wearing a green duffel coat and red Dunlop Wellington boots, three other bears, a Merrythought rabbit and three soft toy figures of Snoopy, Charlie Brown and Woodstock (playwear and faults).